its own gospel. We are taught that these alternative scriptures, which represented intoxicating, daring, and often bizarre ideas, were suppressed in the fourth and fifth centuries, when the Church canonized the gospels we know today: Matthew, Mark, Luke, and John. 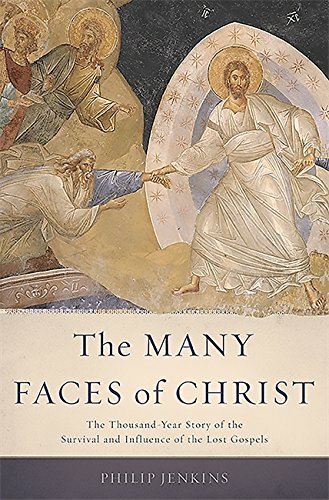 The rest were lost, destroyed, or hidden.In The Many Faces of Christ, the renowned religious historian Philip Jenkins thoroughly refutes our most basic assumptions about the Lost Gospels. He reveals that dozens of alternative gospels not only survived the canonization process but in many cases remained influential texts within the official Church. Whole new gospels continued to be written and accepted. For a thousand years, these strange stories about the life and death of Jesus were freely admitted onto church premises, approved for liturgical reading, read by ordinary laypeople for instruction and pleasure, and cited as authoritative by scholars and theologians.The Lost Gospels spread far and wide, crossing geographic and religious borders. The ancient Gospel of Nicodemus penetrated into Southern and Central Asia, while both Muslims and Jews wrote and propagated gospels of their own. In Europe, meanwhile, it was not until the Reformation and Counter-Reformation that the Lost Gospels were effectively driven from churches. But still, many survived, and some continue to shape Christian practice and belief in our own day.Offering a revelatory new perspective on the formation of the biblical canon, the nature of the early Church, and the evolution of Christianity, The Many Faces of Christ restores these Lost Gospels to their central place in Christian history.